Looking at it from afar, you can be forgiven from thinking that Mt. 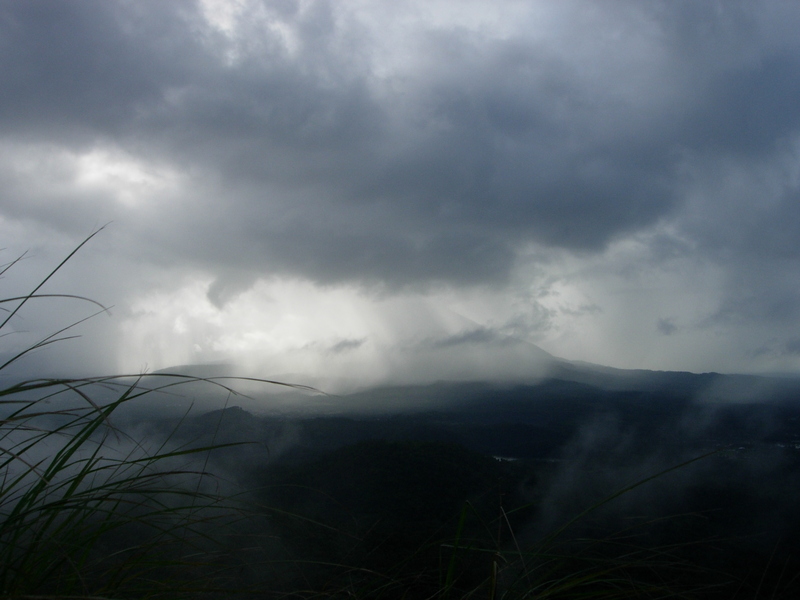 Kalisungan is an easy mountain to climb. 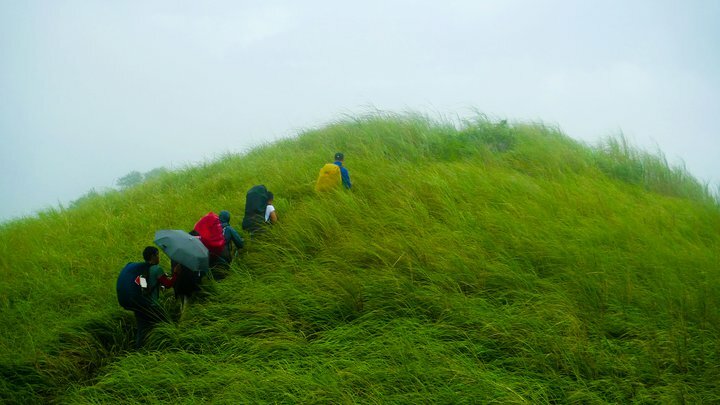 At about 760masl it’s short and again you can be forgiven for classifying its trail difficulty with Gulugod Baboy, Tayak Hill, and even Batulao. After all, one website classifies it as a 3/9. So with all those expectations of an easy and relaxing climb, we headed to Kalisungan last Saturday for the post-Halloween climb of Guys4Men, Inc. There were just 11 of us. I tried in vain to get more people to come, especially newbies, but nobody seemed too excited to go hiking at a moment’s notice. I didn’t get much sleep on the Sta. Cruz, Laguna-bound bus we rode from the bus station behind Wendy’s Buendia as the seats didn’t recline. Maybe because it was only a short trip so the bus wasn’t the 4-seater type. It looked just like the newer air-conditioned buses plying the city streets. We arrived at the duck junction (so-called because there are giant statues of ducks at the center of the road) around 10am. We had brunch and bought some packed lunch. at a roadside eatery. The food was good and had generous servings. The free Batangas bulalo soup which was simmering in a big cauldron by the roadside was hot and tasty but was very very oily. It was like sipping a bowl of pure oil. To supplement my packed dinner, I bought an entire kinulob na itik which was fried, chopped, and packed. baranggay hall to register. There were a couple of guys there who said they were still waiting for 15 more people to join them. Aaaargghh! That meant we had to make sure we arrived at the campgrounds way ahead of them to secure our space. I had made up my mind to go at a slow pace and not tax myself. The trail started easily enough with me and Ujin leading. We hiked for about 15 minutes through flat grassy fields planted with banana trees . We passed 3 young hikers who let us through saying that they were slow. The trail diverged and we took the one that went straight. Ujin and I waited several minutes just to make sure that the others took the same route. We were surprised when the 3 young hikers arrived. They said that the others had already passed them which meant that they probably took the trail that led left. I wasn’t sure now if we took the right one but one of the guys said to always keep on the right. There was also a trail sign (a white ribbon tied to a tree which I didn’t see). We also remembered the woman at the house saying to just keep going straight ahead. I called Arni and told her to backtrack. They arrived about 10 minutes later and we resumed our hike. The trail started to gradually ascend as we trekked on slimy mud. It had been raining incessantly up until yesterday the locals said. It was bright and sunny so we were optimistic there would be no rain. The mountain loomed before us as we made our way across the banana fields. We finally reached the base and from then on the trail just led up and up and up. Mostly banana trees, shrubs, and small plants grew so there was nothing really to hold on to as we negotiated the really slippery trail. I had already taken-out my trekking pole which I normally use for descents only. 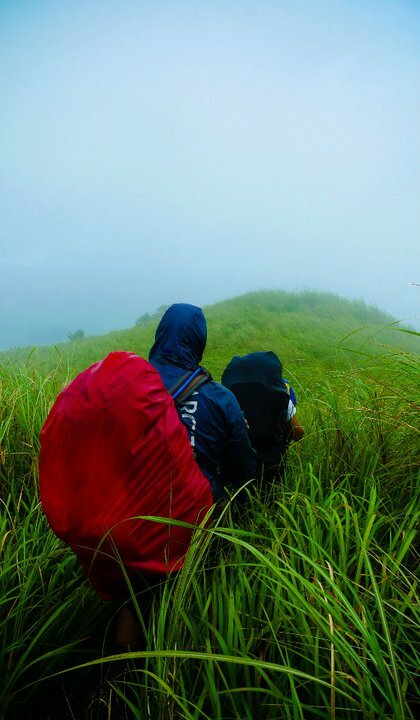 As I made my way up, I was glad for the brunch of 2 cups of rice and a serving of adobo and Bicol express I had at the eatery before starting the climb. I sure needed it. As annoying as the mud were the giant mosquitoes and red ants that the trail seemed to be infested with. By the time we reached the small plateau just an hour away from the summit my legs were covered with giant mosquito bites that were red and swollen. I should have taken better note of the IT which advised bringing mosquito repellent. The mosquitoes simply bit through the leg tights I pulled on. We rested a bit for lunch and waited for the others. I had 3 pieces of tamales and some boiled hotdogs. About 2:30, Edwin, Ujin, and I took off for the summit as the others rested. It was the steepest part of the trail and there wasn’t much to hold on to. As I clambered up I was already thinking how the hell was I gonna get down tomorrow. I fixed my gaze to the clump of trees, the tall cogon grass, and the bright blue sky that was peeking from the foliage. “That’s the summit, ” I said aloud. When I reached the top, my heart sank. It was just the beginning of the cogon trail. Well at least it was not as slippery and as steep plus cogon makes for very good handholds if you don’t mind its roughness. 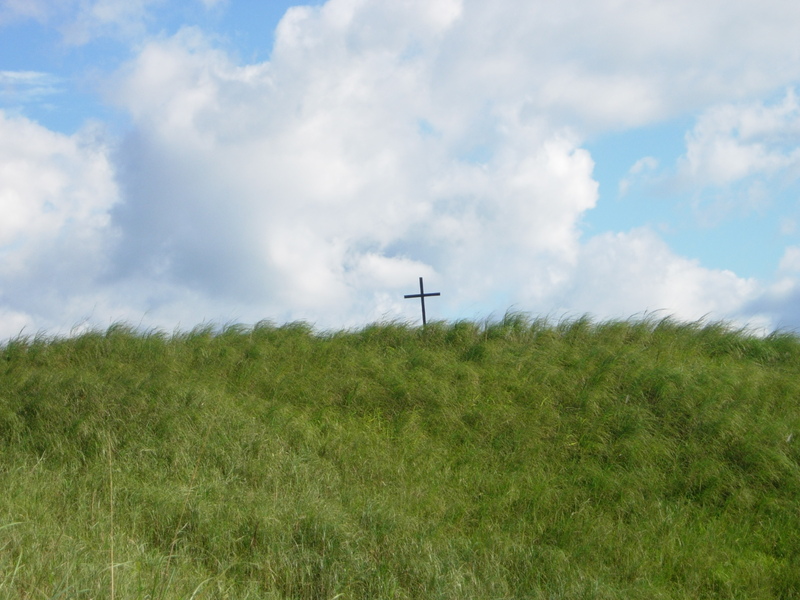 Finally, about 10 minutes later, I broke thought the tall cogon grass and spied the cross perched on top of the summit. The trail had leveled a bit and I quickly crossed to the other side and reached the camp grounds. I dropped my pack, praised God for his Grace and almost wept at the beauty of the 360- degree view. On one side was the cloud-covered peaks of Mt. Banahaw and Cristobal. Opposite was Talim Island and Tagapo. 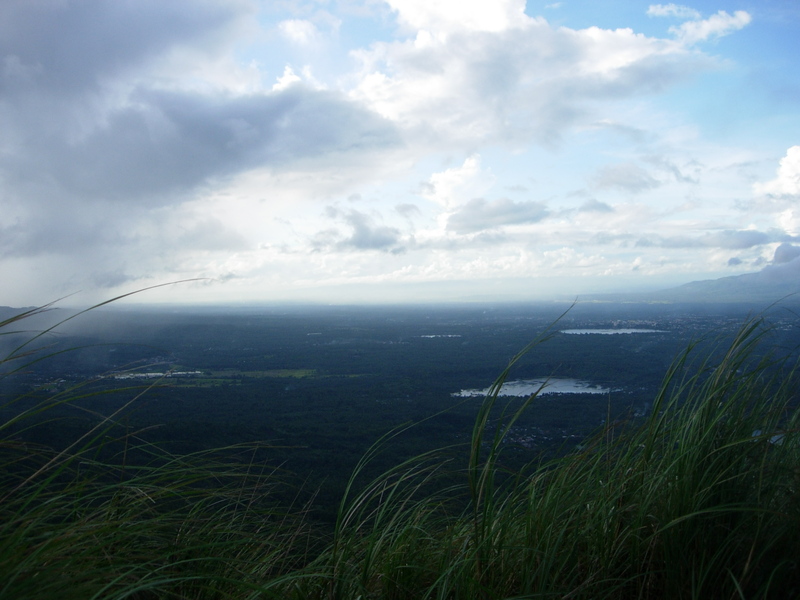 On the other side were the lakes of San Pablo and the entire province of Laguna spread out on the valley below. It was breathtaking. 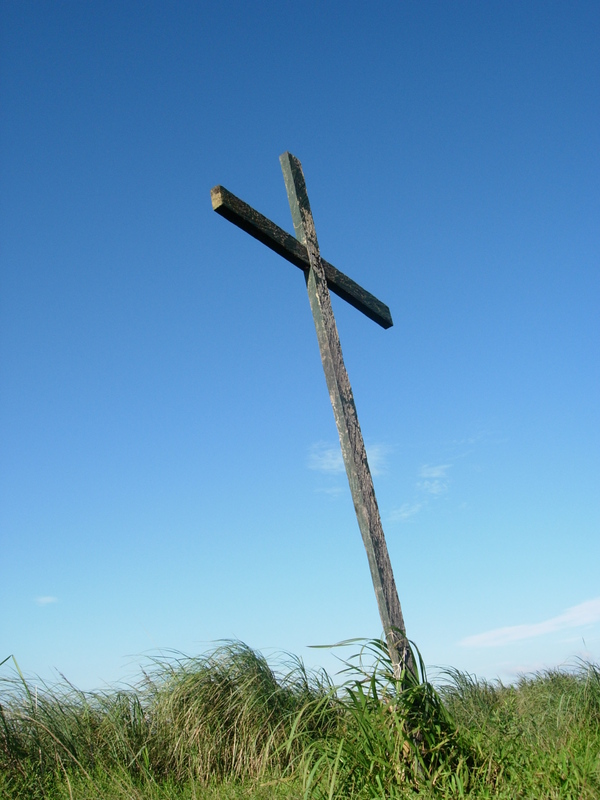 We made camp at the area where the cross stood and where the ground was flatter. The others soon arrived and still we were the only group there. Rex had hired as porter, the Mang Berto who we passed on the way up. He promised to bring us some fresh coconuts the next day. That’s when I noticed the waterproof pouch which contained my wallet, headlamp, and rechargeable batteries gone from my pack”s top pouch. While hiking, a nagging though and hunch came telling me to ensure the zipper was closed as the pouch might fall. I should have listened. Nobody had seen it along the trail. I told Mang Berto to keep an eye out for it. The Php 600 bucks in the wallet is no big loss. It’s my Black Diamond headlamp that’s valuable. Fortunately, the sky was quite bright that night plus my Nokie E63 had a flashlight. The campgrounds was kinda small and the cogon grass that surrounded it was pretty tall and we had to flatten some portions just to get more space. A pretty strong wind was blowing and I had to tie guylines on my tent to keep it stable. The waterproofing on my fly was all gone and I had just seam sealed it so I was hoping there wouldn’t be any rain. This is the first climb where I was light on food. Is it because I’m trying to lose weight? I didn’t even bother to bring a stove and a cook set as everything was pre-cooked — potato and sausage croquettes and itik for dinner, chicken nuggets for breakfast. Pesto bread provided the carbohydrates. I wasn’t really hungry and didn’t even eat much of Arni ‘s angel hair pasta with store-bought and foil-packed carbonara sauce. I managed to just consume about 1/4 of the itik as it was greasy and had a really strong smell and taste. Dessert was some soft cookies. I was really tired and the cold made me sleepy. I skipped socials and just snuggled in my tent. Again, I wished I paid more attention to the IT which advised bringing a jacket. I only had my wind breaker with me and it didn’t do much to keep the cold out. I woke up with the sound of people having socials just outside my tent. They were quite noisy and I was tempted to shoo them away. It seemed more people had arrived. A really strong downpour finally put a stop to it. It was hard to get some sleep as it was really cold. With the “destroyed” rain-proofing, my fly sheet was also damp but at least didn’t leak. The seam sealer I put on a week ago seemed to have worked. I woke-up with an overcast sky and the sound of people making breakfast. I went to bed with only us on the camp grounds. In the morning there were tents everywhere. There were even people camped out on the other side! It seemed everyone had gone on a night trek, including the large group we saw at the waiting area near the trailhead. We broke camp at around 8:30 and started the muddy descent down. It did not help that it was raining intermittently. It was slow going but not as treacherous as I thought it would be. I only slipped once! We kept close to each other as we had received a report from one of the groups that 3 hikers were robbed the night before just a few meters from the trailhead. The robbers, 3 skinny guys, took off with their entire packs! It was pouring when we finally reached the trailhead. For Php 20 we got to use the bathroom at one of the houses to wash-up. My clothes were a muddy mess and so were my shoes. It was good to feel all that mud being washed away. One of the best moments is just sitting on a bench, feeling your body relaxing, after you’ve bathed and sloshed away all that mud off. We hired a jeep (Php 50 each for 11 of us) to take us to Calamba where it would be easier to catch a bus going home. We had lunch at Binalot sa Dahon before getting a Cubao-bound bus. Thankfully, there were enough seats for us. It wasn’t traffic at all and I woke-up about 2 hours later when the conducted announced that we were at Magallanes already. Kalisungan isn’t a particularly hard mountain to climb. It’s relatively easy if you don’t expect it to be as easy as Gulugod Baboy or Tayak. It really was all in the mind as I had my mind set on a trail that though muddy would be easy to negotiate, and certainly not one that went just straight-to-the top.